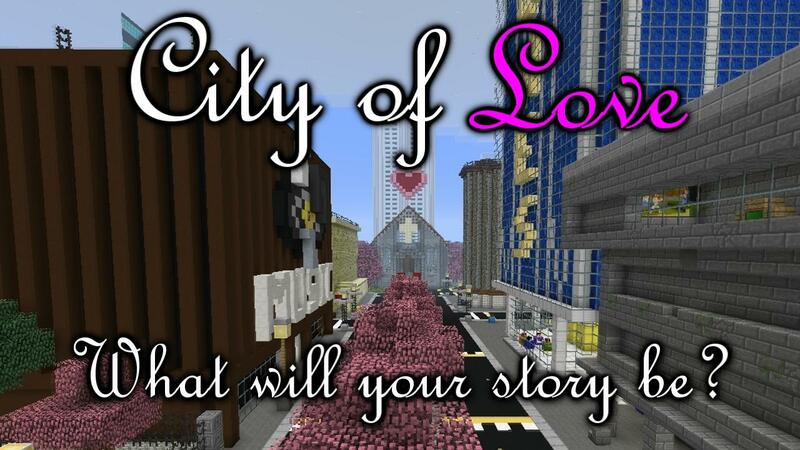 The first ever “dating sim” in Minecraft. Explore the city of love and find your perfect match. Complete loads of challenges to swoon your significant other. Will you find the one right for you or will you amass a bunch of haters? You MUST use the included (its in the download file) texture pack to play this map. If playing on SMP ensure enable-command-block is set to true in the server.properties file! It will not work without these things. This map is intended for single player, however it IS compatible with multiplayer as long as you only have one person talking to a character at a time. IE: if P1 is talking to Amy, P2 cannot talk to Amy, but P2 can be talking to Shaz. For more specifics on multiplayer, more details are inside the map. MUST BE PLAYED IN 1.6.4. Not playable in 1.7 or later. This map is NOT compatible with certain bukkit plugins because it uses vanilla command block commands. Also, it’s very computer intensive and you will likely experience lag on a slower pc. Turning smooth lighting off will help dramatically. If, you didn’t spawn at the beginning, the starting coordinates are: x:-1340 y:57 z:2081. This was supposed to be a 2 week project that ballooned into a full scale adventure/puzzle map. It has some amazing puzzles and challenges including a level of NPC AI that has never been seen before on this scale. There are over 6 different citizens you can end up with, with a tonne of collectibles and things that are tracked over the course of the map. This was a collaboration effort between myself and some very well known map makers. Make sure you check them out! Me – Creator of Eronev.